Updated: Apr 18, 2019 @ 6:59 a.m.
To adopt an animal, you must live within 100 miles of one of our adoption sites (Benld, Litchfield, O'Fallon or Springfield IL) and must be at least 18 years of age. We require that you be physically present to make the final adoption arrangements. We also require that all cats be kept indoors, and all dogs be kept in a fenced-in yard, secure pen, or indoors. Failure to comply with any of these requirements may constitute grounds for our taking back the adopted animal. All pets have been spayed/neutered, are up to date with shots/vaccinations, have been micro-chipped, and are in good health to the best of our knowledge. If you have any questions about the animals, want to know more about the shelter, or have any other questions, please call or e-mail us as above. We have cats arriving at our shelter all the time so, if you do not see what you are looking for on this page, please call us at 217.835.2538, or e-mail us at aap1@frontiernet.net , and tell us what you are looking for. Also, we frequently have kittens too young to be listed on our website, which will however be available once they are spayed/neutered and have their shots. Just make the call and we'll get started on finding you the cat you want. Can you help -- we need you! ​or Lori at 217.415.1459. Thank you! Faith, Flora and Flossie are now at our Petco Cat Condos in Springfield. If you're in the neighborhood stop by and say hello or, better yet, adopt one of them. Comments: Alice was found abandoned at an early age and was in dire need of some good nourishing food and lots of tender loving care when she first arrived at the shelter. She is now doing much better, beginning to fit in, and eagerly looking forward to going home with a kind loving family. "My name is Alice and, if you adopt me, I'll feel like I'm in a wonderland." Comments: Ally was relinquished to our custody due to her owners health problems. She was found in a box alongside the road on a very hot sunny day, and she was in very bad shape, but she was eventually nursed back to health. One of her eyes is cloudy due to an infection when she was very young, but she is not blind. Ally does well with both cats and dogs. She is also called "Squeak", because she rarely meows but she does make squeaking sounds frequently. Ally has been declawed on all 4 paws, so she needs to be an inside cat only. "You can call me 'Ally' cat if you wish, or you can call me 'Squeak' -- after you take me home with you"
Comments: His owner was unable to continue caring for him, so Bingo has lost his home and is now hoping to find a new home with a nice family very soon. He may be a bit shy when you first meet him, but give him a little time to get to know you and he will surely return your affection and you will have a friend for life. "My name is Bingo and if you adopt me you will know that you will have hit the jackpot." Comments: Dillon was found as a stray before being brought to the shelter, and so not a great deal is known about him except that he is FIV Positive, which means that he MUST be in a home with no other cats and NEVER allowed to go outside. This isn't so bad as it sounds providing he goes to a loving household... such as yours? "My name is Dillon and having a home of my own sure would be 'thrillin'." Comments: Her owner was moving and unable to take Faith and her siblings with them, so they came to see us about finding them a good home. She is a pretty little thing, though a bit reserved when meeting new people but, with lots of love and attention, she will soon be your best friend. Faith is still quite playful, though by now she is pretty much over the wild kitty antics. She was raised from a very young kitten in a home, is litter box trained, and used to roaming freely about the house. Faith is hoping to find her forever home with her new family in advance of "kitten season", as she doesn't want to be passed over by someone younger. "My name is Faith, and I have faith that I will soon be adopted into a loving home." Comments: Brought into the shelter as a stray after being found roaming at large where his days were limited, Ferdinand now has another chance at finding happiness in a forever home with a nice family. He is a very loving and friendly boy who, despite all he has endured, still loves people and wants them, and give them all the love and affection that he has to offer. "My name is Ferdinand. Look into my eyes ... you will adopt me at bring me into your home." Comments: Her owner was moving and unable to take Flora and her siblings with them, so they came to see us about finding them a good home. She is a pretty little thing, though a bit reserved when meeting new people but, with lots of love and attention, she will soon be your best friend. Flora is still quite playful, though by now she is pretty much over the wild kitty antics. She was raised from a very young kitten in a home, is litter box trained, and used to roaming freely about the house. Flora is hoping to find her forever home with her new family in advance of "kitten season", as she doesn't want to be passed over by someone younger. "My name is Flora, and if you adopt me I will brighten up your home." Comments: Her owner was moving and unable to take Flossie and her siblings with them, so they came to see us about finding them a good home. She is a pretty little thing, though a bit more reserved than her two sisters, and will need a lot of love and attention to earn your trust. She was raised from a very young kitten in a home, is litter box trained, and used to roaming freely about the house. Flossie is hoping to find her forever home with her new family in advance of "kitten season", as she doesn't want to be passed over by someone younger. "My name is Flossie, and I would like to make your home my home." Comments: Fy was relinquished to our custody after he and his siblings were rescued from his feral mother, in order that they might have a chance to go to a good forever home. Fy was adopted 04.02.14 and returned to the shelter on 10.23.16, after his owner passed away and there was no one else there to care for him. He was adopted again on 07.24.17 and then returned on 08.18.17, purportedly because he wasn't playful and didn't want to be "messed with". Fy is really a good boy and is hoping for another chance to show just what a great companion he can make someone. "Fee-Fy-fo-fum; I want to go home with someone." 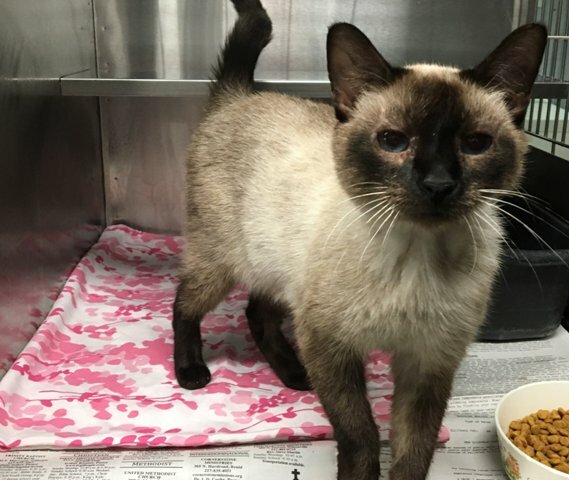 Comments: His owner was no longer able to care for Herman, so he was relinquished to the shelter in order that we might find him a comfortable and loving home for life. He is FIV Positive, but that doesn't mean that he can't be adopted, he just needs to be the only cat in the home or in a home with only other FIV Positive cats, and must never be allowed outdoors. Herman is looking for that special person who will understand his situation, and provide him with the home that he needs. My name is Herman, but that doesn't mean that I have to live like a hermit." Comments: Infinity attended the Cat Show hoping to win a ribbon and a home. Unfortunately, she didn't find a home and her spot was filled at Animal Control, so she would have been euthanized if she had returned. She is hoping that someone will come by and adopt her soon, as she knows that space is valuable and she doesn't want to overstay her visit here. "It seems as though I've been waiting for a new home for an 'Infinity'." Comments: Isabella was relinquished to the shelter by her owner after it was found that she was not happy sharing her home with the children. She is a beautiful girl who is looking for a cozy home with an adult family, and you won't have to worry about the furniture because she has been declawed. "My name is Isabella, and I would love to live the life of a queen." Comments: Her owner passed away and she is very confused by what is happening to her. She is in a strange place, surrounded by people and other cats she has never seen before and is very scared. She is not very trusting of men and would prefer a female owner in a nice quiet home. Izzy is house trained and would prefer a home without young children. I"m hoping that some kindly person will provide me with a nice cozy forever home." Comments: Joey is a friendly and handsome little guy, very lovable and eager to please. He was found roaming around as a stray when he was picked up and held by Animal Control, but no one ever came around to claim him. Joey is looking for his forever home with a loving family in a cozy home, where he will provide you with his purring companionship and earn his keep by keeping you entertained. "My name is Joey. Don't you think that's an appropriate name for a friendly boy like me?" Comments: Kitty Mama was released to us by her owner who could not keep her. She had been the "neighborhood cat" for 15 years and, though she was given food, she was not given the care that she needed, but she continued to have litter after litter of kittens. Kitty Mama is partially blind and it appears as though a chunk may have been bitten off one of her ears. This poor girl has had a hard life and deserves to spend her remaining years in a quiet loving home. "Nobody knows the troubles I've seen -- or the litters either." Comments: Lucy was released to us by her owner, who took her in during sub-zero weather and gave her food and shelter until she could find another home. She was likely feral and involved in the TNR program, as she still has her days, however she is also a very loving cat, who would like a chance to show some family what a great companion she could make them, if only they would give her a chance. "My name is Lucy. Wouldn't you like to love Lucy?" Comments: His owner had too many to care for them all, so Marty and his siblings came to see us at the shelter in order that we might find them all good homes. His former owner did allow them to stay for awhile but, once they started taking up more space and requiring more food, it was time for them to go to new homes. Marty has lived in a house but hasn't had daily contact with people. He is still uncomfortable being held and cuddled, and will require time and lots of attention to become comfortable in his new surroundings. "My name is Marty and I would like to get to know YOU better!" Comments: Mary is a very beautiful cat and can be playful and somewhat giddy as well as spunky, while at the same time being a loving cat. She has a teasing nature and enjoys playing with her toys or hoping into your lap as the mood strikes her. Mary is house trained and prefers a home without other cats, dogs or young children. "This 'Proud Mary' is yearning for a home of her very own." Comments: Her owner had too many to care for them all, so Mia and her siblings came to see us at the shelter in order that we might find them all good homes. Her former owner did allow them to stay for awhile but, once they started taking up more space and requiring more food, it was time for them to go to new homes. Mia has lived in a house but hasn't had daily contact with people. She is still uncomfortable being held and cuddled, and will require time and lots of attention to become comfortable in her new surroundings. "My name is Mia and I want to come live with you and make your home "mia" home." Comments: His owner had too many to care for them all, so Miles and his siblings came to see us at the shelter in order that we might find them all good homes. His former owner did allow them to stay for awhile but, once they started taking up more space and requiring more food, it was time for them to go to new homes. Miles has lived in a house but hasn't had daily contact with people. He is still uncomfortable being held and cuddled, and will require time and lots of attention to become comfortable in his new surroundings. "My name is Miles and I have "miles" to go before I can sleep in my new forever home." Comments: Mocha came to the shelter as a stray, along with her mom and siblings. Now that she has been weaned, she is hoping to find a good home of her own where she will be loved and cared for for life. She has spent several weeks in a foster home, so she knows what it's like to have a home, lots of toys to play with, and even uses the litter box. Mocha is very playful and will provide you with many hours of entertainment and lots and lots of love and affection. "My name is Mocha and I will warm you up like a cup of the same." Comments: Her owner had too many to care for them all, so Mona and her siblings came to see us at the shelter in order that we might find them all good homes. Her former owner did allow them to stay for awhile but, once they started taking up more space and requiring more food, it was time for them to go to new homes. Mona has lived in a house but hasn't had daily contact with people. She is still uncomfortable being held and cuddled, and will require time and lots of attention to become comfortable in her new surroundings. "My name is Mona and, if you can find another cat named Lisa, you will have a "Mona-Lisa" in your home." Comments: Moonpie came to the shelter as a stray, along with his mom and siblings. Now that he has been weaned, he is hoping to find a good home of his own where he will be loved and cared for for life. He has spent several weeks in a foster home, so he knows what it's like to have a home, lots of toys to play with, and even uses the litter box. Moonpie is very playful and will provide you with many hours of entertainment and lots and lots of love and affection. ​"My name is Moonpie, and I'm really a very friendly sort of a guy." Comments: Mr Jenkins was relinquished to us by his owner who was unable to keep him any longer. He is a friendly guy, sweet and lovable, who also just happens to be FIV Positive. He is still adoptable, but must either be the only cat in the home or in a home with only other FIV Positive cats, and he must not be allowed outdoors at any time. No matter, he will just spend his time indoors with his favorite person -- you! "My name is Mr Jenkins, but we can just drop the 'Mr' if you like." Comments: Myah was relinquished to our custody by her owner who could not continue caring for her any longer. She is a friendly girl, though may be a bit shy when she first meets you. She needs some tender, loving care, but is ready to move on and into a new home with someone who will give her a chance to become comfortable in her new surroundings. Myah was adopted 05.30.18 and returned on 07.17.18 because she wasn't using her litter box and didn't care much for the other cats in the household. She might do better as an only cat. "My name is Myah, and rumor has it that I'm descended from a long line of Indian Princesses." Comments: Princess was relinquished to us by her owner who was moving and couldn't take her with them. She is a friendly girl but very concerned about her future at this time, which is understandable having lost her comfortable home. Princess has gone through a number of changes recently, and she hasn't received the care or attention that she needs and craves, so she will need a little extra attention in her new home. "I'm not asking to be treated like a "Princess", but I do need to be loved." Comments: Rosalita was pregnant and her owner already had too many cats to be able to care for her and her anticipated brood, so she was relinquished to our custody. She gave birth shortly after her arrival at the shelter and, when they were old enough, her kittens were all adopted out to good homes, but Rosalita is still at the shelter waiting to go to her forever home. She is a sweet and friendly young lady who is hoping to be going to her new perfect home very soon. "My name is Rosalita, though I've never owned a canteena." Comments: Rosie is not used to living with a lot of other cats and would prefer to be an only cat in the household. She is very sweet but likes to decide for herself what she wants to do and when she wants to do it. She is looking for someone to give her the love and attention that she craves. Rosie is house trained, and would do well as the only cat in the household. "Hey! Don't forget about me; I'm still here patiently waiting to go home with you." Comments: Though her front claws have been removed, Tabby still finds it easy to get up high and down low whenever she decides to claim a particular space as her own. She is somewhat ambiguous about other cats and can take them or leave them without really caring one way or the other. Tabby would probably tolerate another cat in the household with traits similar to her own. She likes to make her own decisions about things and live life in her own fashion. Tabby is house trained and she has been declawed, so she must be an inside cat only. "I am available and I can be yours. Just call 217.835.2538 and ask for Tabby."